The market is a beautiful thing. It’s driven by supply and demand dynamics, or buyers and sellers, based on reasons that we don’t need to know. I’ve noticed that most market participants like to worry about the “why.” We choose to worry about the “where,” the “when,” and the “for how long.” That’s a much better use of our time, particularly if our only goal is to make money. We’re not interested in writing gossip columns. Today, I’d like to talk about one of those fancy “why” terms that gets thrown around with little meaning or purpose. That’s “overhead supply.” What does it mean when you hear “overhead supply?” How does it help anyone? For me, “overhead supply” is when there are an overwhelming number of sellers relative to the number of buyers around a certain price. Sometimes, you get the smartass in the room who says, “Well, J.C., for every buyer there must be a seller…” Yes, dummy, but there aren’t an equivalent number of willing buyers and willing sellers at every price. That’s why stocks move. 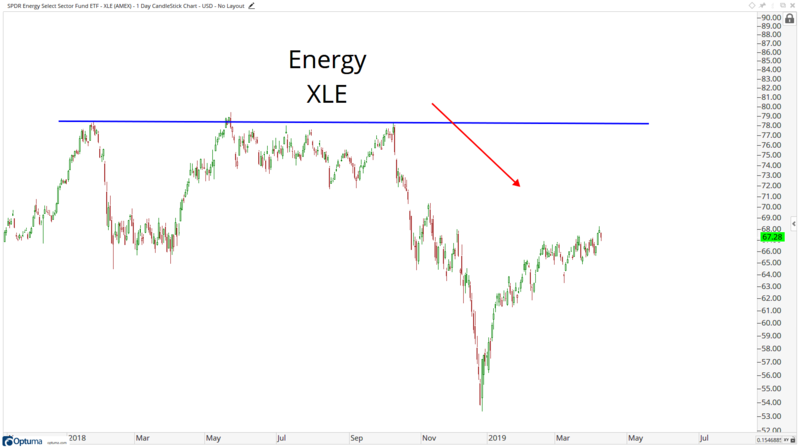 The idea behind overhead supply is that it takes time for demand to absorb it before prices can move higher. 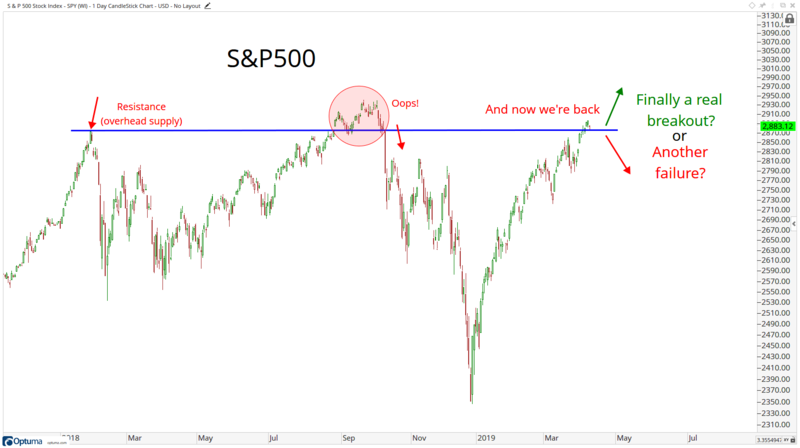 For example, there was an overwhelming amount of supply relative to demand in the S&P 500 Index in early 2018 just below 2,900. We know that because when prices got there, the index sold off. There were more willing sellers than buyers there – that’s a fact, not my opinion. When prices returned to that area in September, prices broke above it, temporarily, before failing and selling off again. This failed breakout was accompanied by deteriorating breadth and momentum. Only a fraction of stocks were making new highs, and only a fraction were showing positive momentum characteristics compared to the prior highs earlier in 2018. Here we are again, knocking on the door for the third time. Will we finally break out? Or is this going to be another failure? I think it’s likely to continue to be a mess. 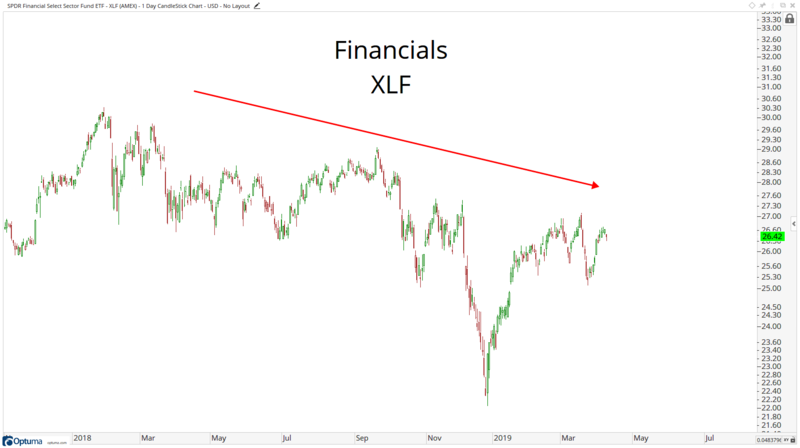 We have mixed signals from what actually makes up this market – the stocks themselves. 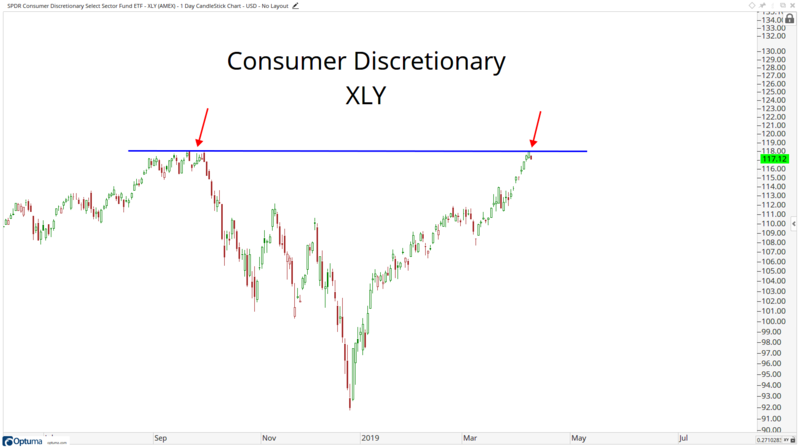 Consumer Discretionary is testing those highs as well. If this is “it,” I expect Tech and Discretionary to lead the way higher. If this is “not it,” I expect these breakouts to fail up here. These are the leadership groups, without question. We take a “weight of the evidence” approach. We also try to focus more on individual stocks themselves than the overall market. While it’s important to put things into context, there have been, and continue to be, opportunities at the individual stock level. It’s an “if you don’t like banks, don’t buy banks… if you like Tech, buy Tech” sort of mentality. So, what’s the risk here? For me, the biggest risk is all-out failure up here from the leaders. 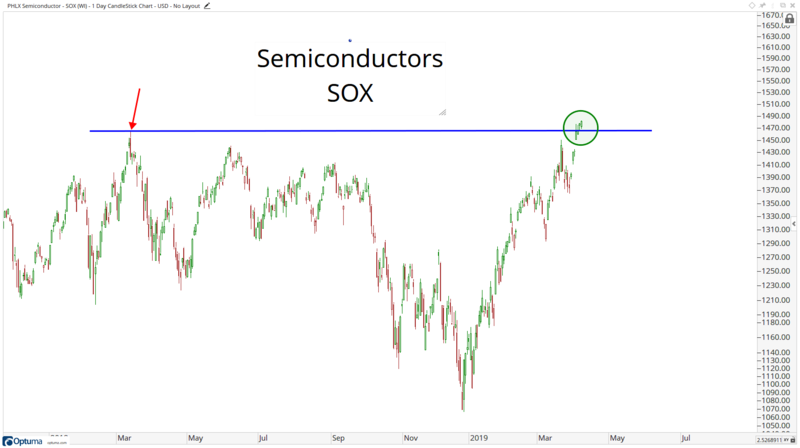 If we see Semis start to fall back below the March 2018 highs – or, even worse, fall below 1,430 – things can really get hairy for the overall market. The lack of participation by most of the market sets up this risk factor that we need to take into account. We don’t want to be aggressively long in that scenario. That would create a similar sort of setup as what we saw in early October 2018. Maybe not to such an extreme, but downside risk nonetheless. It’s messy out there. 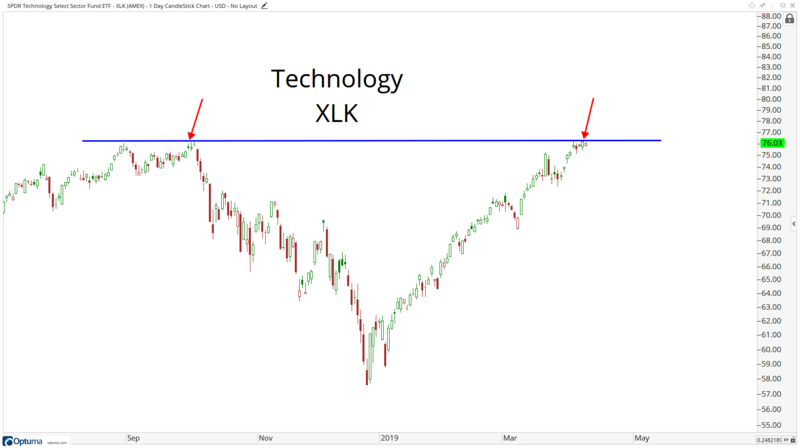 I think there are good setups with well-defined risk – and exponentially greater potential reward. That’s all we can really ask for. There are good charts and bad ones from a short-term perspective. But there are huge bases everywhere from a long-term perspective that we should not forget about. 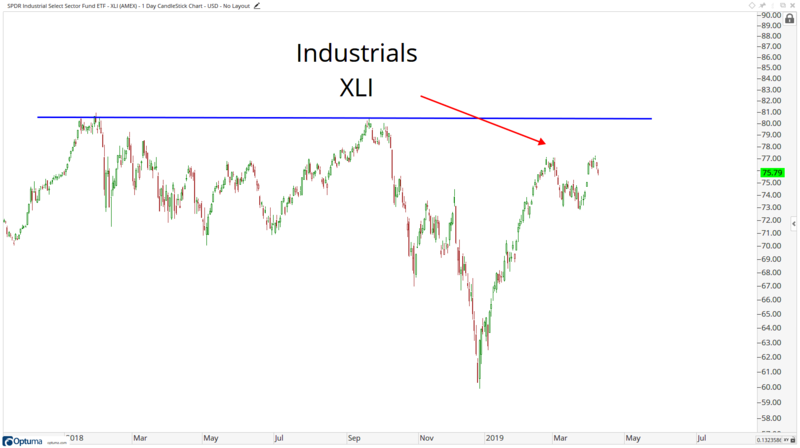 To answer the first question about the S&P 500 – is this a new breakout or just another failure? How about “neither”? I think we likely keep chopping around a bit in the indexes, presenting more opportunities at the individual stock level. How about that?